Bethany Community Church of Greenlake offers satellite services on Sundays in Meadowbrook at the Nathan Hale High School. This new faith community in Meadowbrook was a 2015 partner for the Lake City Holiday Project and a welcome partner in the campaign. 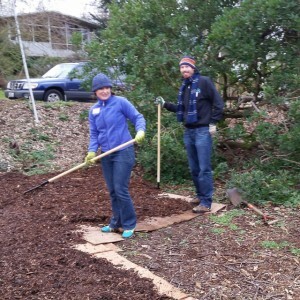 This past January, members rolled up their sleeves and continued that community spirit and care. 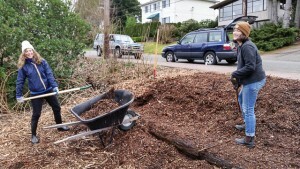 The Edible Hedge at the Meadowbrook Orchard is slated for upgrades and the group put pitchfork to mulch to further that goal. Having a variety of commitments from many different communities strengthens long term goals at MCGO. 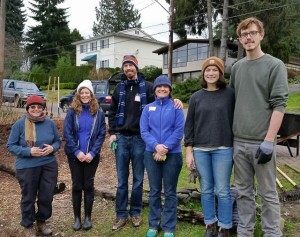 To have new groups connecting gives strength to those on the front line battling weeds, moving water, dumping mulch and grabbing ‘Aleve’ after a rigorous day at MCGO. We are fortunate to be able to connect with BCC in Meadowbrook. Welcome and ‘thank you’.